Ronan Truelove barely survived his first encounter with his father and the Bend Sinister. Now, he’s determined to become one of the Blood Guard, a sword-wielding secret society sworn to protect thirty-six pure souls crucial to the world’s survival. 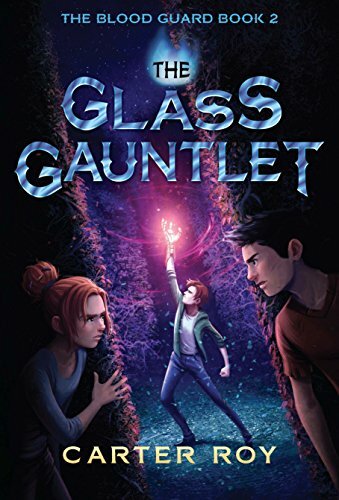 Eager to prove he’s got what it takes, Ronan is sent on his first mission with his friends Greta and Sammy to visit a weird-sounding school and take a series of tests called the Glass Gauntlet. Paper and pencils and nerdy scholarship—where’s the life-or-death challenge in that? But the Glass Gauntlet is actually something much more dangerous: head-to-head competitions against ruthless opponents. Nothing and no one are what they seem. Who can he trust, and who will kill him? Ronan has to figure it out fast because his enemies are multiplying, and soon he will have to pass the ultimate test: facing his father again and standing up to those who threaten not only him and his friends but also the world. The Glass Gauntlet is a wonderful follow-up to The Blood Guard; I actually enjoyed it more. As mentioned in my earlier review of The Blood Guard this series is reminiscent of the Percy Jackson books but it is a completely different story that stands on its own. Carter Roy is not a copycat by any means. You feel a similarity but it is such that your child, or a grownup like me, will be thrilled to read. A series that provides a fresh perspective upon a great theme. As in Rick Riordan’s work there is a training camp for the Blood Guard. Unlike the incredibly high-tech and magical training camp in Riordan’s books, the Blood Guard have a camp that is rugged, completely low-tech, and run on a shoestring budget. I find that it is just as interesting and that it better captures my imagination. Everything that the Blood Guard works with is, well… cheap. Roy does provide us with all things high-tech though. They are used by the Blood Guard’s evil nemesis, the Bend Sinister (and one incredible Bend Sinister foster-child escapee to the good side). The Bend Sinister's extremely expensive and high-tech weapons, vehicles, and facilities make me loath them even more. The Blood Guard use creativity combined with organic materials already existing in their environment. What a great way to help a kid stuck in an electronic age to see the possibilities in which all things non-tech can be used. Those nasty Bend Sinister guys and all their expensive junk come across as manipulative users...or just plain lazy. Also, don’t forget that the Bend Sinister get beat down by the Blood Guard at every turn. The Glass Gauntlet is filled with non-stop fun and action that would take the energy of a pre-teen or magically enhanced grownup to keep up with. Your child's heart rate may increase but it shouldn't be too dangerous. Don’t forget though; you have to accept danger to be a member of the Blood Guard. For my fellow Christian parents: Please read my review of The Blood Guard for qualifiers. Carter Roy has painted houses and worked on construction sites; waited tables and driven delivery trucks; been a stage hand for rock bands and a videographer on a cruise ship; worked as a line cook in a kitchen, a projectionist in a movie theater, and a rhetoric teacher at a university. He has been a reference librarian and a bookseller, edited hundreds of books for major publishers, and written award-winning short-stories for adult readers that appeared in a half-dozen journals and anthologies. But this is the first time he has written a novel. He lives in New York City.